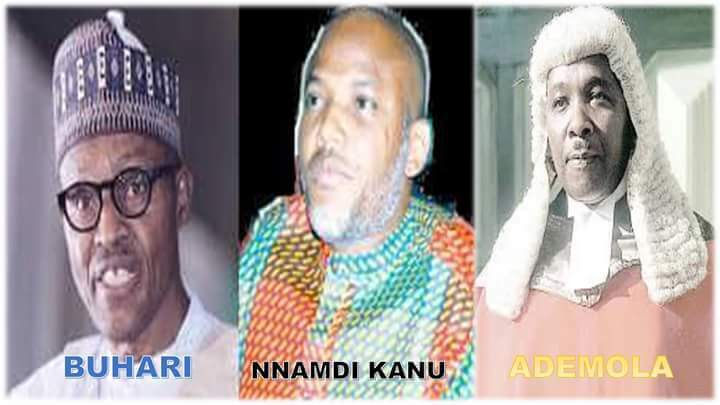 Adeniyi Ademola, a judge of the federal high court Abuja, says he was arrested by the Department of State Services (DSS) because he granted Sambo Dasuki bail and freed Nnamdi Kanu, leader of the Indigenous People of Biafra (IPOB) leader. Last weekend, some judges’ homes were raided by the DSS on allegations of corruption.But in a letter dated October 11, addressed to Mahmoud Mohammed, chief justice of Nigeria (CJN), Ademola said he was held for over 24 hours before he was told the reason why he was brought to the DSS office.“…Upon signing the document, they told me that I am under arrest and ordered me with guns still pointed at me to move outside. As I was going, they told me they were taking me to their office, Department of State Services (DSS) office, without showing any warrant of arrest,” the letter read. “I obeyed them and about six o’clock in the morning, I was whisked away from my residence to the DSS office without any warrant of arrest or reason for my arrest. Ademola said he saw his arrest as revenge from Abubakar Malami, attorney-general of the federation (AGF), whose arrest and detention he ordered over a professional misconduct while he was judge in Kano between 2004 and 2008.